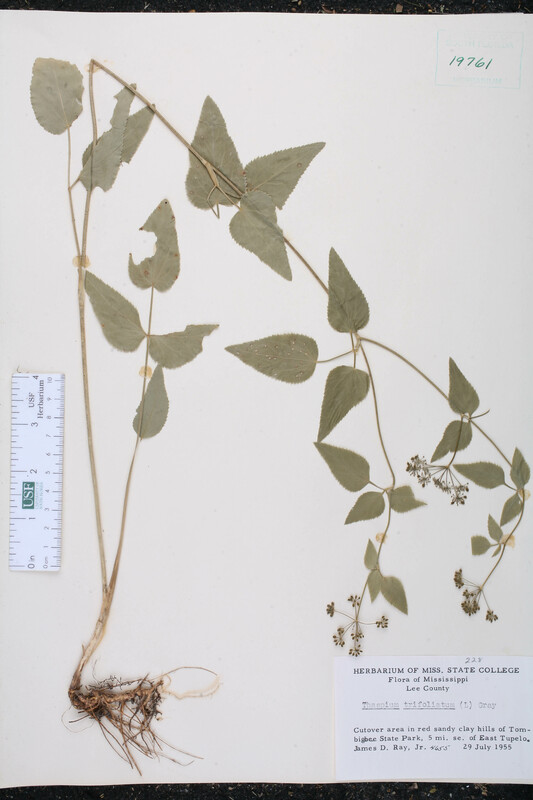 Citation THASPIUM TRIFOLIATUM (Linnaeus) A. Gray, Manual, ed. 2. 156. 1856. 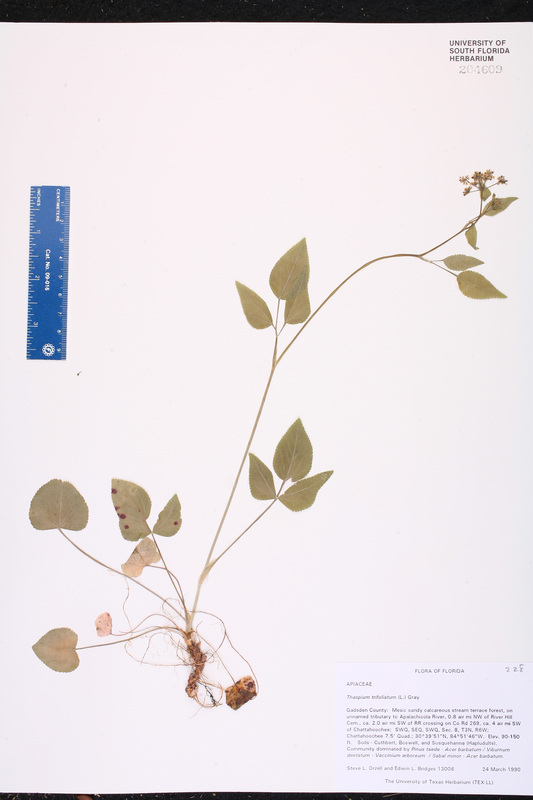 Basionym: Thapsia trifoliata Linnaeus 1753. Type: VIRGINIA: Without data, Kalm s.n. (lectotype: LINN 368.3). Lectotypified by Fernald, Rhodora 41: 442. 1939. Smyrnium cordatum Smyrnium cordatum Walter, Fl. Carol. 114. 1788, nom. illegit. 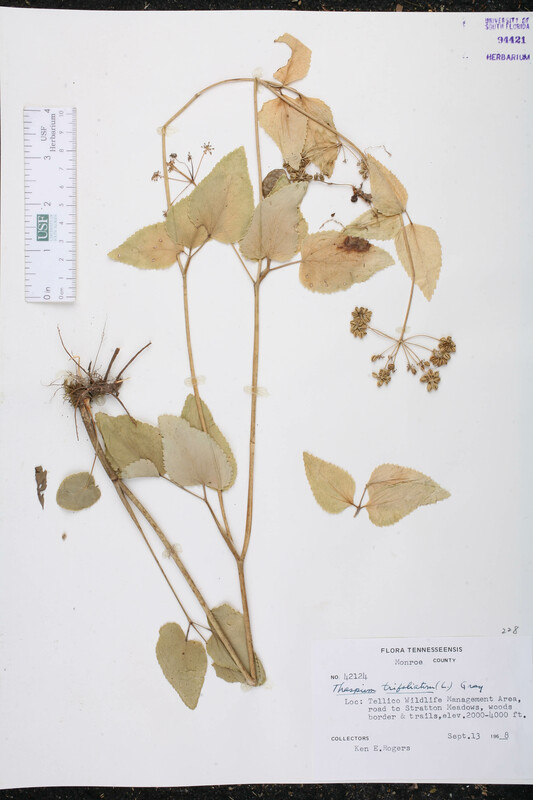 BASIONYM: Thapsia trifoliata Linnaeus 1753. Thapsia trifoliata Thapsia trifoliata Linnaeus, Sp. Pl. 262. 1753. TYPE: VIRGINIA: Without data, Kalm s.n. (lectotype: LINN 368.3). Lectotypified by Fernald, Rhodora 41: 442. 1939. Thaspium aureum var. 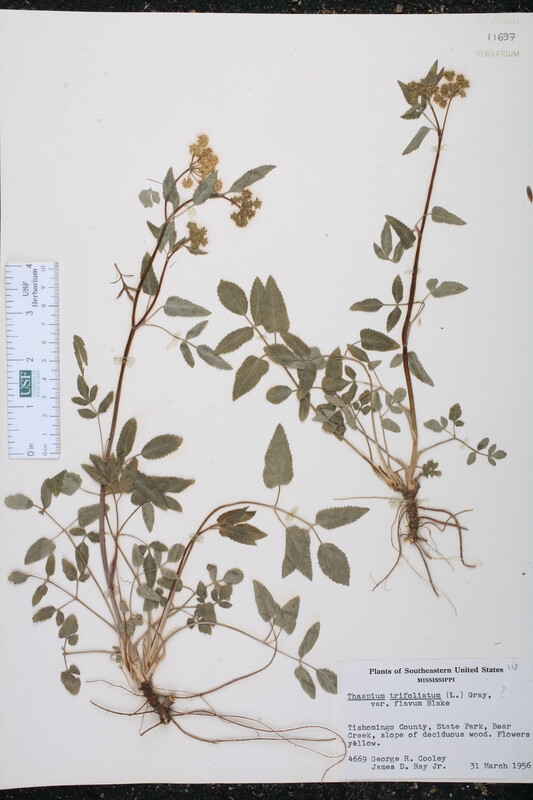 cordatum Thaspium aureum (Linnaeus) Nuttall, var. cordatum Britton et al., Prelim. Cat. 22. 1888, nom. illegit. BASIONYM: Smyrnium cordatum Walter 1788, nom. illegit. 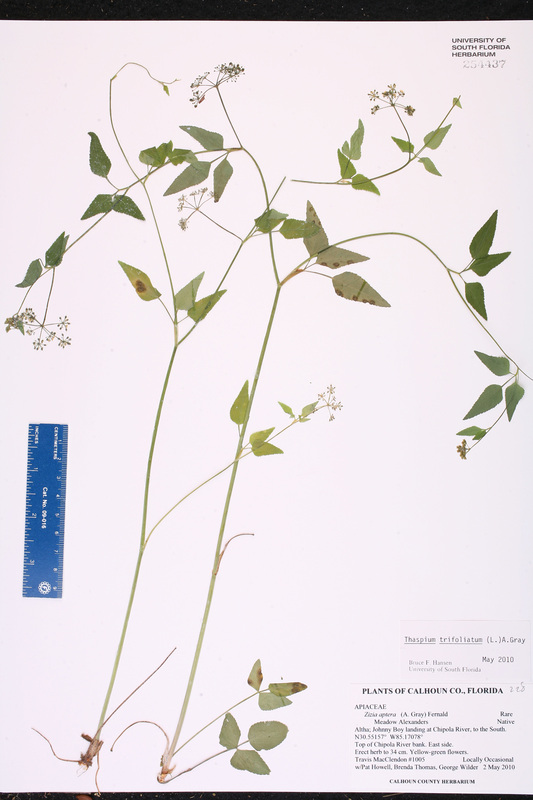 ; Thapsia trifoliata Linnaeus 1753. Thaspium aureum var. 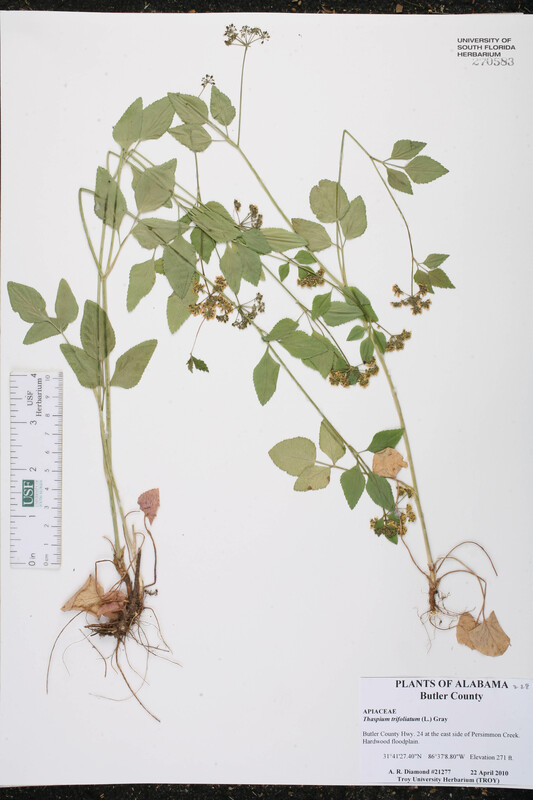 trifoliatum Thaspium aureum (Linnaeus) Nuttall, var. 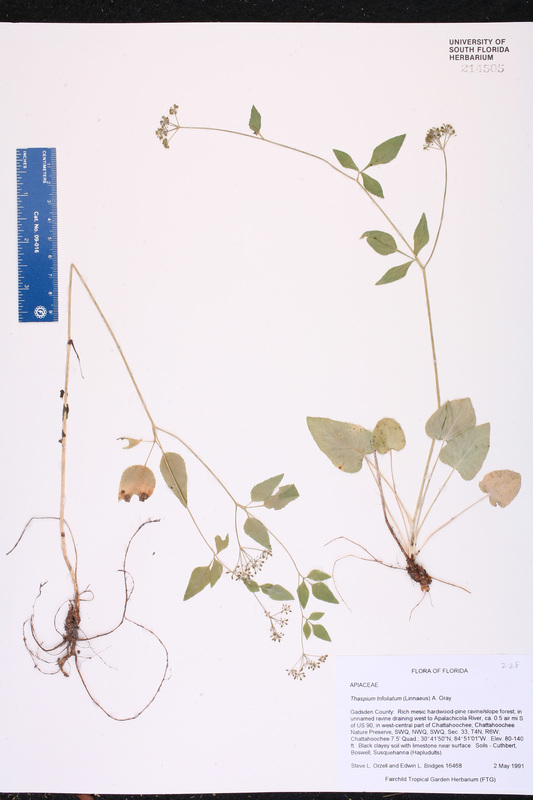 trifoliatum (Linnaeus) Britton et al., Prelim. Cat. 22. 1888. 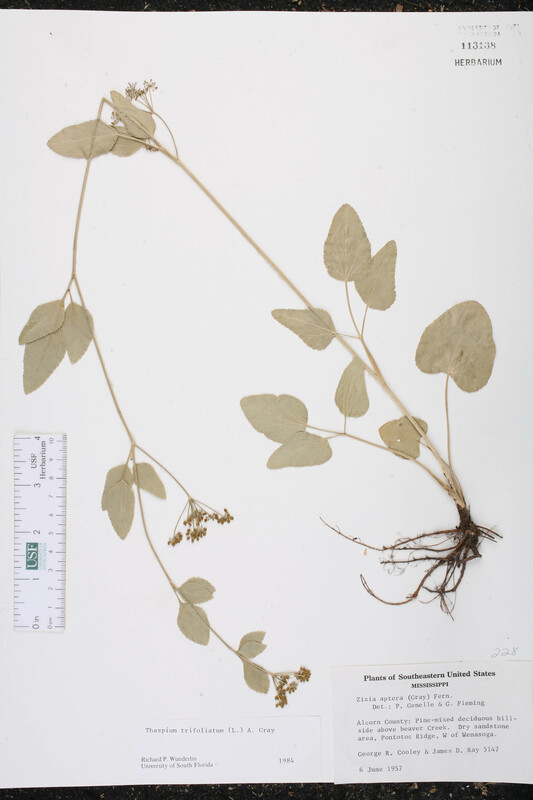 BASIONYM: Thapsia trifoliata Linnaeus 1753. Thaspium cordatum Thaspium cordatum Torrey & A. Gray, Fl. N. Amer. 1: 615. 1840, nom. illegit. BASIONYM: Smyrnium cordatum Walter 1788, nom. illegit. 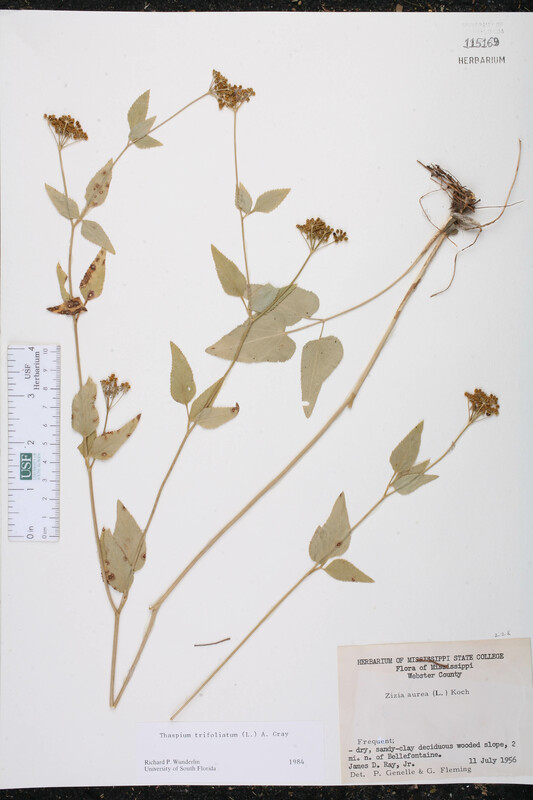 ; Thapsia trifoliata Linnaeus 1753. Thaspium cordatum var. atropurpureum Thaspium cordatum Torrey & A. Gray, var. atropurpureum A. W. Wood, Class-Book Bot., ed. 2. 289. 1847, nom. inadmiss. BASIONYM: Thaspium cordatum Torrey & A. Gray 1840, nom. illegit. 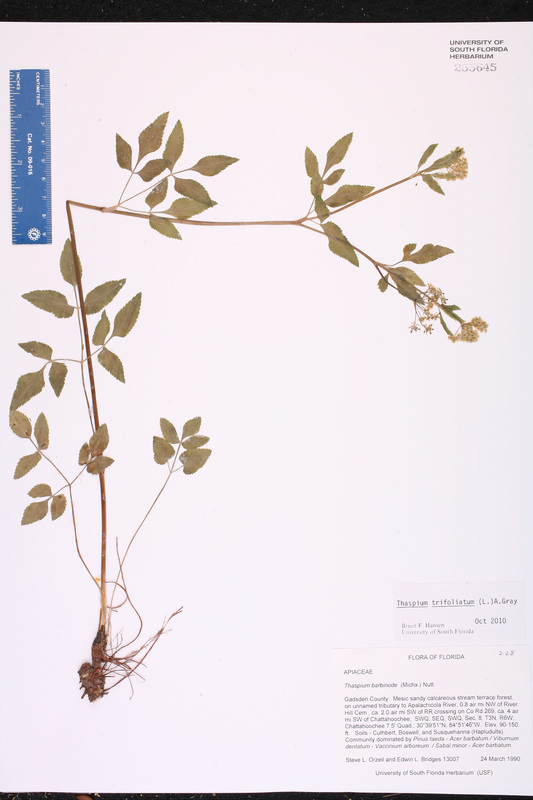 ; Smyrnium cordatum Walter 1788, nom. illegit. 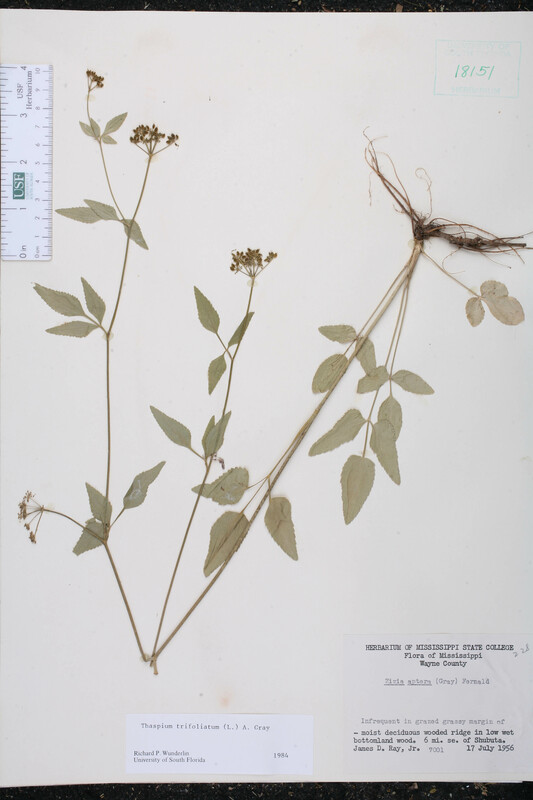 ; Thapsia trifoliata Linnaeus 1753. Thaspium ziziopsis Thaspium ziziopsis Daniels, Univ. Missouri Stud., Sci. Ser. 1: 329. 1907, nom. illegit. 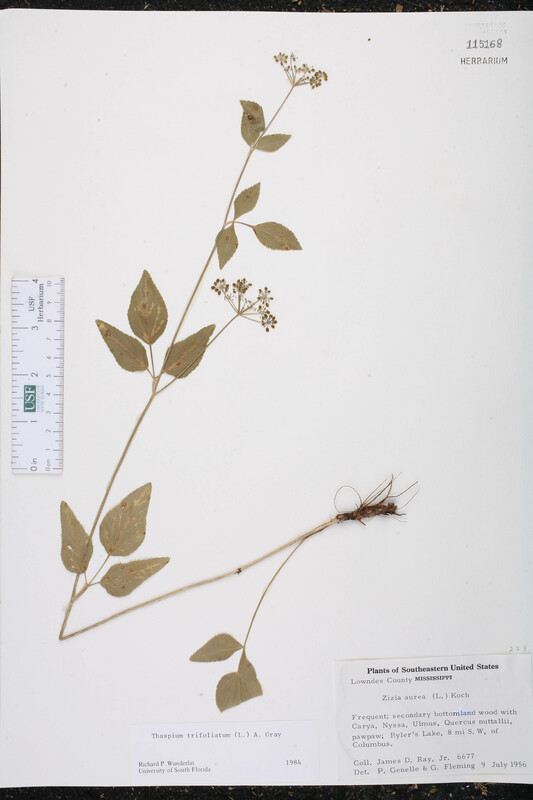 BASIONYM: Thapsia trifoliata Linnaeus 1753. Zizia cordata Zizia cordata W. D. J. Koch ex de Candolle, Prodr. 4: 100. 1830, nom. illegit. BASIONYM: Smyrnium cordatum Walter 1788, nom. illegit. ; Thapsia trifoliata Linnaeus 1753. Cnidium atropurpureum Cnidium atropurpureum (Desrousseaux) Sprengel, in Roemer & Schultes, Syst. Veg. 6: 418. 1820. BASIONYM: Smyrnium atropurpureum Desrousseaux 1791. Smyrnium atropurpureum Smyrnium atropurpureum Desrousseaux, in Lamarck, Encycl. 3: 667. 1791. 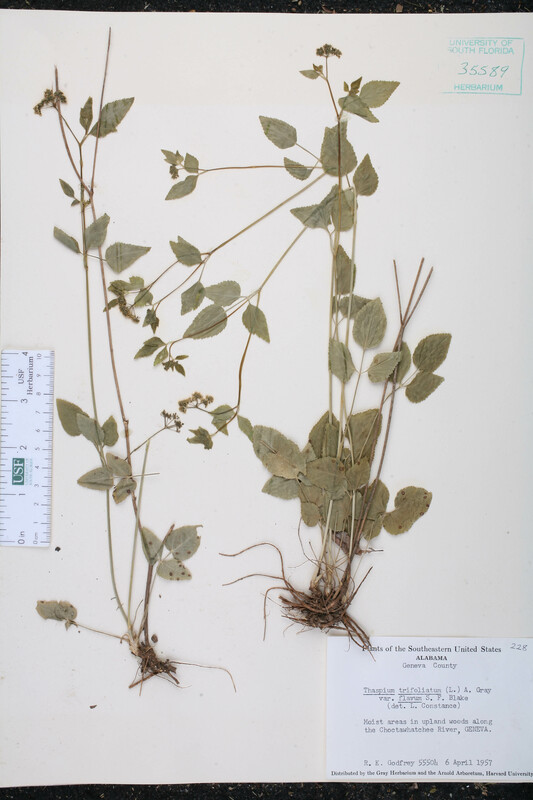 Thaspium atropurpureum Thaspium atropurpureum (Desrousseaux) Nuttall, Gen. N. Amer. Pl. 1: 196. 1818. BASIONYM: Smyrnium atropurpureum Desrousseaux 1791. Thaspium aureum var. 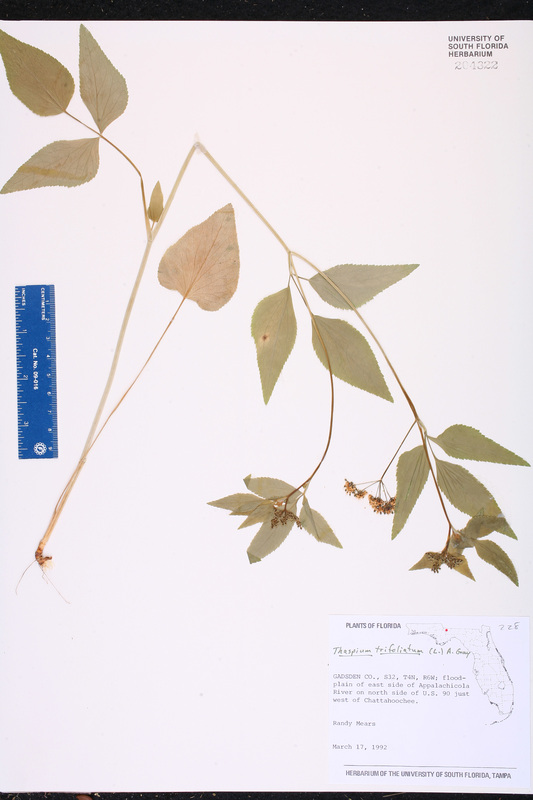 atropurpureum Thaspium aureum (Linnaeus) Nuttall, var. atropurpureum (Desrousseaux) J. M. Coulter & Rose, Bot. Gaz. 12; !36. 1887. BASIONYM: Smyrnium atropurpureum Desrousseaux 1791. Thaspium trifoliatum forma atropurpureum Thaspium trifoliatum (Linnaeus) A. Gray, forma atropurpureum (Desrousseaux) Farwell, Rep. (Annual) Michigan Acad. Sci. 21: 369. 1920. BASIONYM: Smyrnium atropurpureum Desrousseaux 1791. 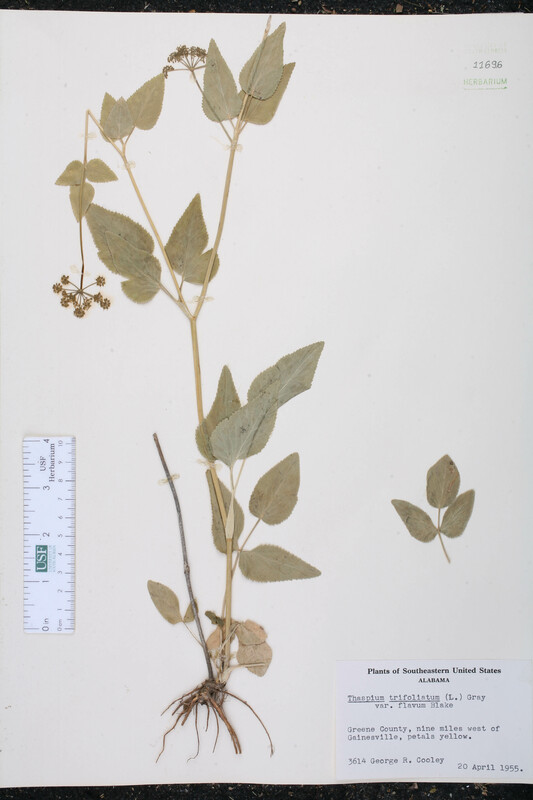 Thaspium trifoliatum var. 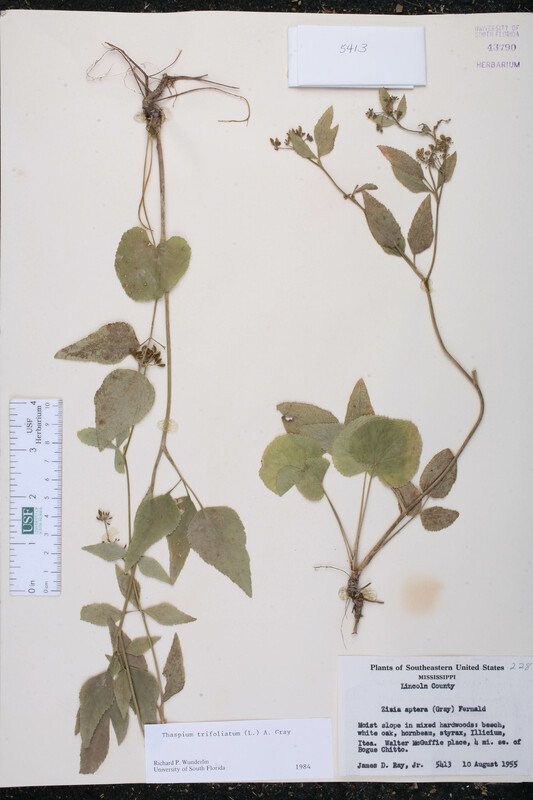 atropurpureum Thaspium trifoliatum (Linnaeus) A. Gray, var. atropurpureum (Desrousseaux) Torrey & A. Gray ex A. Gray, Manual, ed. 2. 156. 1856. BASIONYM: Smyrnium atropurpureum Desrousseaux 1791. Upopion heterophylum Upopion heterophylum Rafinesque, New Fl. 4: 31. 1838 ("1836"), nom. illegit. BASIONYM: Smyrnium atropurpureum Desrousseaux 1791. 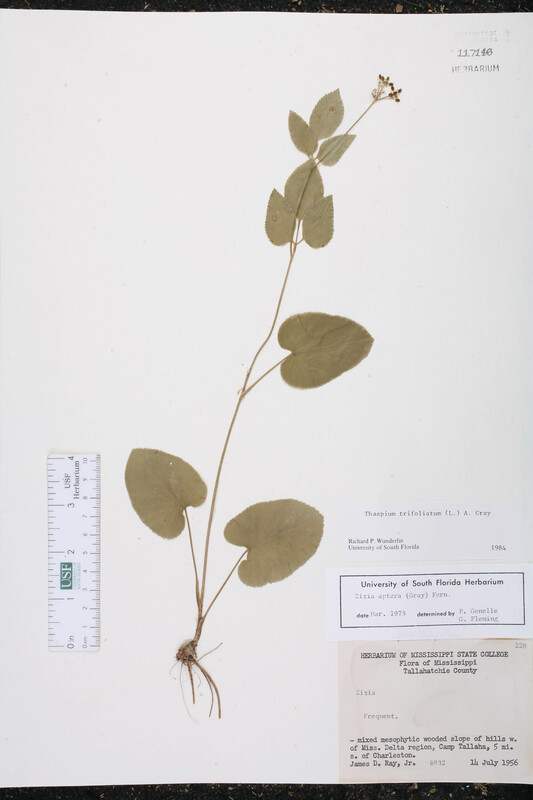 Upopion lobatum Upopion lobatum Rafinesque, New Fl. 4: 30. 1838 ("1836"). Upopion lobatum var. rigidum Upopion lobatum Rafinesque, var. 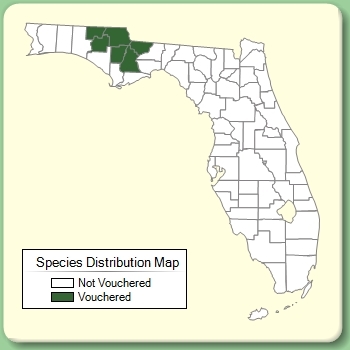 rigidum Rafinesque, New Fl. 4: 30. 1838 ("1836"). Upopion trifoliatum Upopion trifoliatum Rafinesque, New Fl. 4: 30. 1838 ("1836"). USA Florida Gadsden Co. 17 Mar 1992 R. Mears s.n. USA Mississippi Webster Co. 11 Jul 1956 J. D. Ray, Jr. s.n.